News – Tagged "roshambo sunglasses"
Living in San Diego will teach you one thing: the sun is in full effect year round. But with the extra sun exposure comes the need for sun safety for kids and the entire family. Don’t let the upcoming “winter” weather fool you, even on a cloudy cool day the sun’s rays can be damaging your kiddos skin and eyes. Be sun safe with these sun safety tips for kids you can’t ignore as a San Diego mom. Check out this awesome article about Ro·Sham·Bo Baby in SDVoyager, and be sure to also check out our kids' shades, like these pink and white baby Wayfarer sunglasses! Today we’d like to introduce you to Scott Morris. Scott, please share your story with us. How did you get to where you are today? Ro·Sham·Bo Baby is owned and operated by San Diego family Scott, Julia and their baby girls, Avery (4) and Chloe (1). We started our little company after realizing that nobody was making high-quality baby sunglasses or stylish baby shades while at a Padres game with a friend’s four-month-old who was staring up at the bright sun with no protection. Scott put his adult sunglasses on him and lightning struck: Little People Deserve Big People Shades. that means making our stylish baby shades in Italy instead of China. That means making them safe, durable, flexible, and chewable for little mouths. And that means making them just as stylish as designer adult shades. Two years later, after a lot of frustration and dead ends finding the perfect manufacturing partner and creating the perfect material for the shades, we had the world’s best high-quality baby sunglasses ready for your little ones and ours! scott didn’t want stop there though, he wanted to wear matching unbreakable shades with his then 2-year-old Avery, so we made kids and adult sizes so the whole family can match! Our name Ro·Sham·Bo Baby is a reference to the nostalgic game we all grew up playing (otherwise know as “rock, paper, scissors,” it also pays tribute to our autism support mission: a special education teacher in our family told us that playing Ro·Sham·Bo can be a valuable teaching tool when kids need a quiet, calming, and personal interaction with a teacher. We have autism in our family, so giving a portion of each sale to autism charity has been and always will be a pillar of our business. We launched in June 2013 with a crowdfunding campaign to test the market for stylish baby shades and build up needed capital to fund more inventory and build this website. The result was overwhelming and the customer support and glowing feedback we received further fueled our ambition to make this dream of producing and selling high-quality baby sunglasses a reality. Now 5 years after launch, Julia and Scott were finally able to leave their previous full-time jobs behind to focus on the business, and we moved into our office and warehouse in the Vista/Bressi Ranch area in 2017. We have a long way to go but are super proud of how far we have come. We now have 5 sizes for the whole family from baby to adult large, we launched our prescription fulfillment service in 2017 (like Warby Parker for kids!) to rave reviews from parents, and we are working on new products all the time! We have distribution in over 10 countries, have sent over 100,000 pairs of shades into the world, and earned thousands of 5-star reviews from happy parents. We love what we do and love seeing the smiling faces in shades we get to see every day from our customer submitted photos. At first, it was a struggle just to stay afloat and keep the business going. When we launched, Scott worked as an attorney at one of San Diego’s premier law firms, Latham & Watkins in their downtown office (they have since moved to Del Mar). That job did not afford for much free time for a side hustle, so he took the big risk of leaving that ultra-competitive and lucrative career path to take an opportunity in academia. He started a job at the University of San Diego Law School as the business was getting underway partly motivated by a desire to have a more reliable work schedule that would allow him to spend nights and weekends on the business (even lunchtimes running to the post office to drop off orders!). Julia was also working full time as a social media marketing professional at a fast-growing San Diego firm, Amobee, in Mira Mesa/Sorrento Valley area. After over 3 years of trying to make 2 full-time jobs, now 2 baby girls (Avery and Chloe, now almost 5 and 2), and a growing side business work, it was time to take the leap and go full time or give up the dream. We have grown in sales every year since we started the business, but when Scott took the plunge in 2016 to start pursuing the business full time, we could not have anticipated how fast we would grow. We did more than 5 times our sales from the previous year in 2016 and then doubled that again in 2017. Our biggest challenge has been a great one: keeping inventory in stock! Selling all of your inventory is great, but selling out in the middle of summer and leaving unhappy potential customers is not great for a small family company trying to grow! Figuring out how to gain exposure and successfully advertise our product has also proven challenging. At first, we did really well with Facebook advertising, a skill Julia was able to capitalize on from her previous profession, but that became more expensive in mid-2017 due to changes Facebook made to their advertising algorithm. So, we decided to expand more into distribution and retail sales, which has so far gone really well. Our shades are carried in hundreds of stores in the US and over 10 countries internationally, but there is still a LONG way to go. We even went out on a limb and tried out for Shark Tank in 2017! Believe it or not, we got all the way to final consideration for the 2018 season – we were invited to make a 10 minute video for the producers and had several audition calls with the executive producers of the show before they told us we did not make the cut, It was hard news to get because they had told us we were down to only a handful of businesses in consideration! Please tell us about Ro·Sham·Bo Baby. Little People Deserve Big People Shades. Our bendable kids' glasses block 100% of uva/b/c rays and are Italian made, not from China or Taiwan like our competitors. The specially formulated flexible but durable and soft material is BPA-free, lead-free, latex free, and specially designed for baby’s use and abuse. we even mold our logos into the design to avoid unnecessary paint. They are virtually indestructible. if you or your kids manage to break them, we replace them no questions asked. We also offer a full lens replacement guarantee for lost or scratched lenses. They are ultra light (so light they can float!) and even prescription ready! In fact, in 2017 we launched our online prescription fulfillment service, kind of like Warby Parker for kids. Parents can get their kids unbreakable frames for less than $100. Plus, because of the soft material, kids can swap their prescription lenses into as many different frames colors as they want, so they can always have a pair of bendable kids' glasses to match their outfit or mood! We can do clear lenses, tinted, polarized, even Transitions lenses! Despite all of these advantages, our price point is right in line with our major competitors that make their products in China. We are incredibly proud of the quality of our product, the fact that we do everything in-house here in our Vista office: customer service, inventory, packing, shipping, social media, all of it. We are also so proud that we can employ talented recent grads from USD and Cal State San Marcos to work with us, not to mention a young man on the autism spectrum who helps construct our packaging! Playing baseball in Encinitas little league. Riding bikes to Blockbuster with my best friend from Flora Vista elementary who is now a Navy SEAL and was best man at our wedding in Pacific Beach 10 years ago(!). Padres games with my family at Jack Murphy stadium; playing catch in the parking lot, hot dogs, Tony Gywnn. Working the morning shift from 6-10 am at the Potato Shack in Encinitas on summer mornings and heading to Moonlight Beach after to play volleyball and nap in the sand. La Costa Canyon Maverick football games. Late night Filibertos burritos after the game. This year I have spent all twelve months stocking our family’s entryway closet with board games and activities. 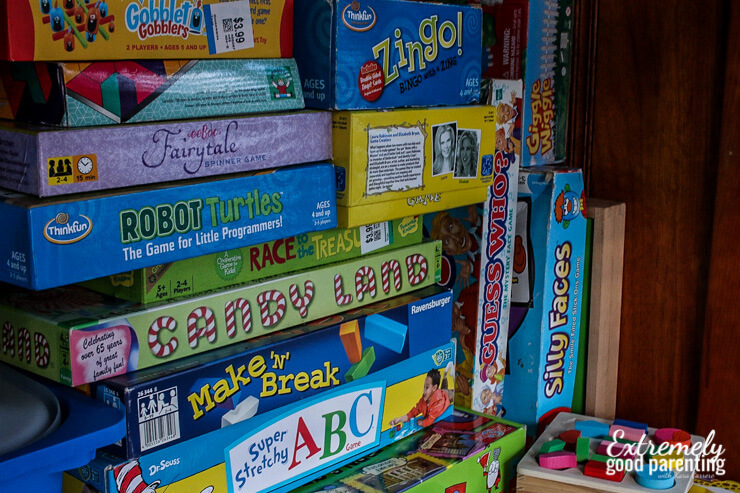 In fact, we have more fun board games for toddlers in our house than we have broken crayons and spare socks combined… and that’s a lot. Too many days in the past our family was looking for a fun, relaxing night together and we’d switch on the TV searching for a movie. It was easy, but we paid the price. The price being time well spent making solid memories with one another. The price being engaging learning opportunities. The price being giving our kids screens instead of our attention. Perusing online deals and $3 thrift shop games has become a pastime. Because I know an investment of under $5 is the cheapest entertainment around. I also know that even spending $50 on an amazing game will pay for itself by not going to the movie theaters even just once. Or not getting a tutor because gameschooling is the best schooling. Or it even pays for itself after 6 months if we decide to ditch Netflix or approximately 10 movies rented on Amazon Prime. And the dividends are priceless. Our 4-year-old learned basic math. Our whole family spends time together. And introducing new learning skills (or facilitating what taught in school) isn’t a battle, it’s an enjoyable treat. The teacher in me wants every experience to have some level of learning. And YES all games can teach something. But I love the games that are well thought out and a little more off the beaten path best. 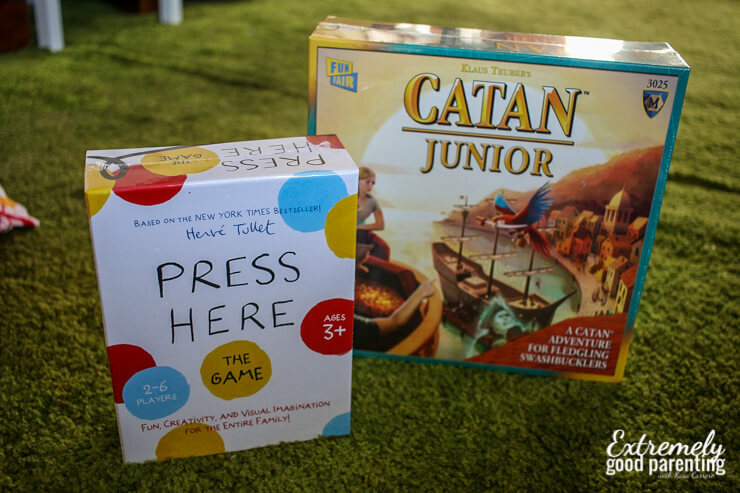 So I’ve compiled 19 of our family’s favorite games for 5-year-olds (with a range on either side) plus about 6 more common board games for early elementary kids. And if you have any other great suggestions, be sure to share them in the comments! 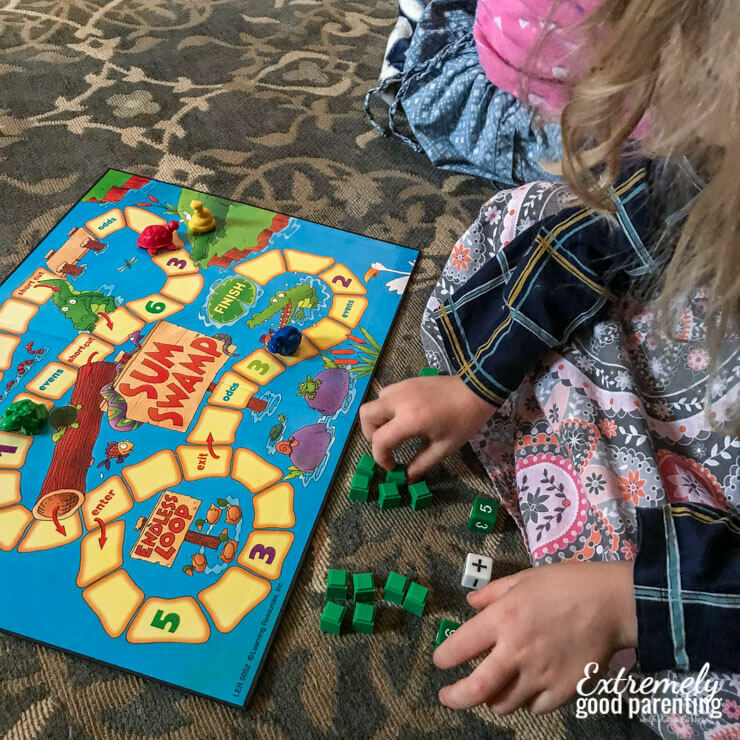 These educational board games for toddlers help develop strategy, problem-solving, logic, focus & attention, math, language, science, movement and cooperation skills. This game was on a wish list of mine for two years and it didn’t disappoint. It really helps kids understand how to logically plan, but also to be flexible as each turn can really change how the next play plays. It’s also great for teaching kids some of the modes of transportation but also attention skills because of small details that make cards either playable or not. 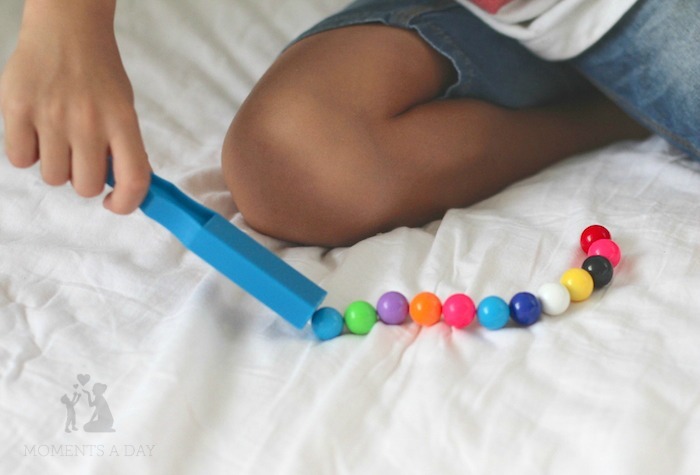 A fun game of patterning and basic coding, this game is a favorite between my 5-year-old Jenn and my husband. In fact, it was the entry into other coding games and activities for her. It’s a really cute game with number recognition, addition and subtraction, odds, and evens, and general early math skills. We introduced this game to Jenn when she was 4 and it was the perfect way for her to learn basic math without even know that’s what she was actually doing. We busted out some counting cubes too to help her visualize the math until she gets better. Yep, it’s a classic. 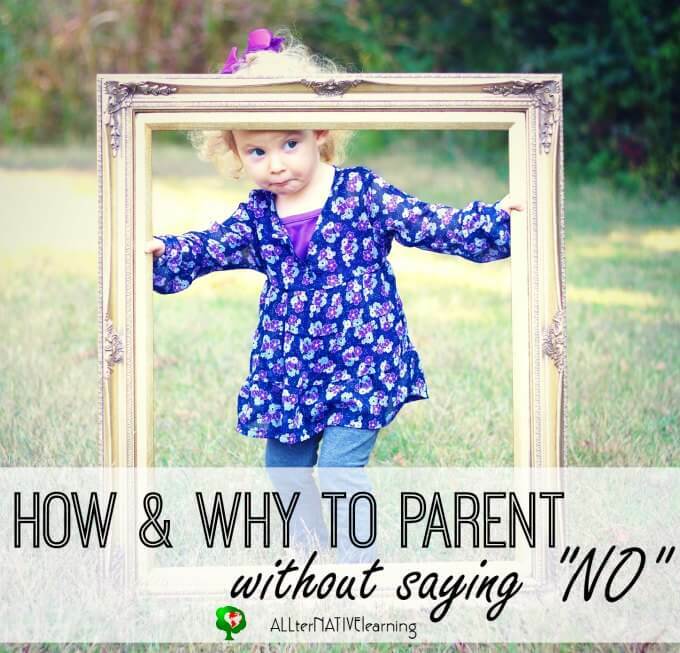 But a fun way to play it is to make a rule that your kids can’t ask questions like “If your person a man” or things of that nature. If you want to get really into details, maybe do an art project where you add tiny images to the pictures to force better attention to detail. Based on a book (that I also highly recommend), Press Here plays with color theory. It has an interesting element of logic because while some of the answers have a cut and dry conclusion, some cards could have mulitple answers and all players have to agree upon the person’s explanation. We even play this with the younger kids in our house too! Some basic map skills and team work will get you to the treasure! This is a great game that was brought as entertainment for 13 kindergarteners at a birthday party… because cooperation was required and no one could leave sad. It’s not super complex, but still fun, especially at an age where working together is a skill that should be built. Tic Tac Toe is kind of boring, but goblet gobblers adds a fun twist and strategy to ultimately elminate someone else’s play. 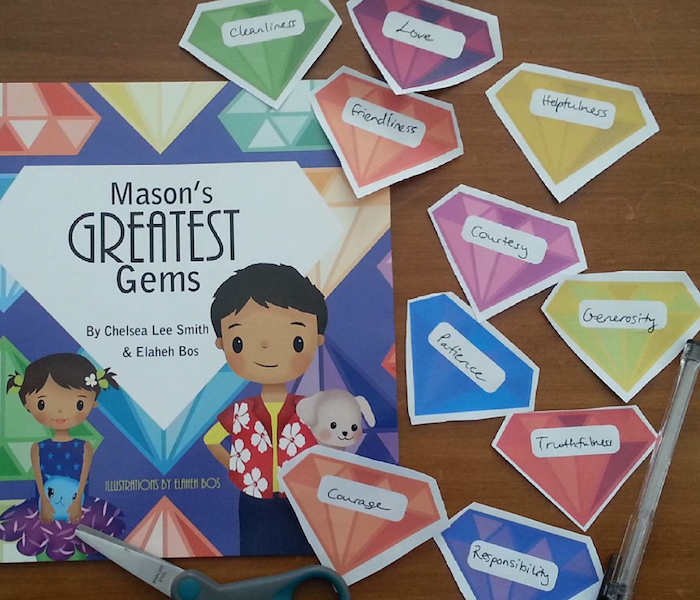 This is a fabulous game for the entire family no matter how young, but as kids get into kindergarten, it’s great for working on reading and language skills. Of course, match the pictures, but do they know how to read the word? Add an element of fun by adding a bit of electrical tape to cover up eithe the words or pictures to really work on spelling and reading. We started playing this family game wit no timer as “just make the picture” and progressed from there. It really built on our kids’ spatial skills and even motor skills as they stacked blocks! We orginally got this for our 2-year-old to learn colors, but it’s also a great game for young kids to play together. It focuses on patterns and making colorful snakes! There are actually multiple versions and expansion sets, but the premise is the same… roll the dice and tell a story. I love this with kids of all ages both young and old because it forces creativity and builds this language and storytelling skills. This games is all about shapes, colors, and patterns. Almost like a mixture of banangrams (which by the way, kids’ banangramas is GREAT for teaching wor formation and the sounds of letters), rummy, and a bunch of colorful shapes. It teaches kids to logically plan ahead and build patterns and sequences. A wonderful, and beautiful, apples-to-apples type of game that encourages your child to use their descriptive words@ It helps kids looks at art in a creative way or even literal way! Each active player has to describe their card and then everyone else choose a card from their hand they think could closely match the decription. Then everyone tries to guess which card is the “real” card being described! If you get any “scary looking” cards, just take them out before playing. I found this one at a thrift store and thought I would give it a try and it turned out to be a HUGE HIT. One of the reasons that I love it as a teacher is that it focuses on the elements of a story. For instance a player has to spin in order to choose a setting, a hero, and other parts to what will then become their masterpiece of a fairytale story! While it doesn’t give the quantities in the recipes, it gives a basic understanding that one must have certain ingredients to make certain recipes. It also shows that food can go bad and is a fun twist on a memory game to gather up the cards you need for your own recipe! (Though… we have lost one of our telescoping spoons). 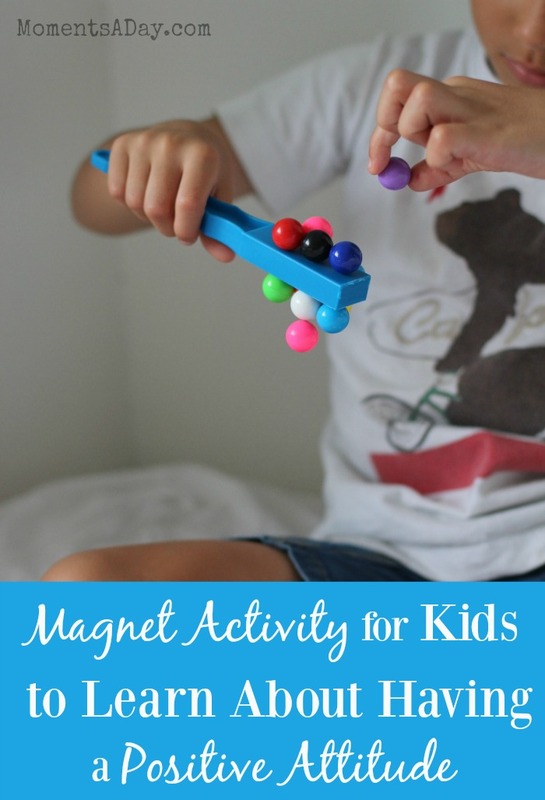 We picked this up at a local toystore on vacation and it was great family fun! The object is to shut all the numbers on the box! It requires some srategy if your kindergartener is going to add up the numbers (practicing their math skills) or use the individual numbers on the dice to shut as many as possible. Just to throw a few more games out there that we enjoy playing at this age are as follows: Mystery Garden, 4 in a row, Brainiac, Busytown, Scrabble Jr., Boggle Jr.. Each have different teaching tools from spelling to strategy, etc. And I would say Catan Jr. too since it’s pictured above, but it requires an adult team member because it’s a bit complex for kindergarteners. 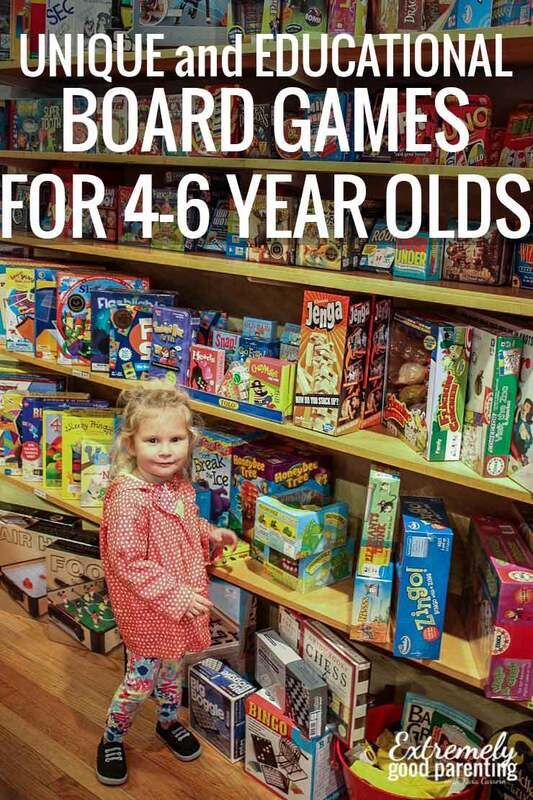 But I would really love to know what YOUR family’s favorite game for this age group is! 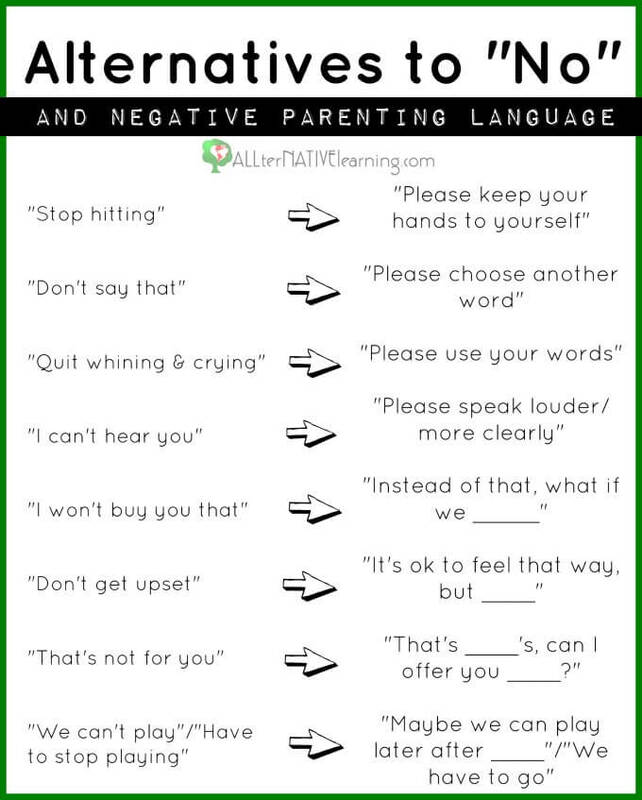 Children learn in different ways. Some kids love active games while others enjoy storybooks better. Some children enjoy listening to someone speaking while others prefer to experiment with a new concept through a hands-on project. Of course it is ideal to offer children educational opportunities using all the various learning strategies, but if you know your child well you can seek out some specific activities you know they will enjoy. I personally have a son who adores arts and crafts. He really relishes putting something together that looks nice, and so I have been finding more crafty activities for him to engage in relating to the subjects we are currently exploring at home. If you are a long time reader of my blog, you will know that we love to talk about emotions in our home. When children can learn to identify emotions and understand how they feel, they not only develop more self-awareness and empathy for others but they can begin to process highly emotional situations with increasing resilience and self-regulation. For the littlest explorers who cannot draw pictures or use scissors yet but want to join in the crafty fun (like my two-year-old who wants to do everything big brother does! ), the fun jumbo feelings stampers from Child.com.au that are pictured above are awesome. They are easy to use with poster paint or ink stamp pads, and have ten emotional faces to discuss with the kids while you are all stamping away. Make a colourful Feeling Spinner with paper plates to explore the different coloured emotional faces (a perfect follow up activity to watching the movie Inside Out). 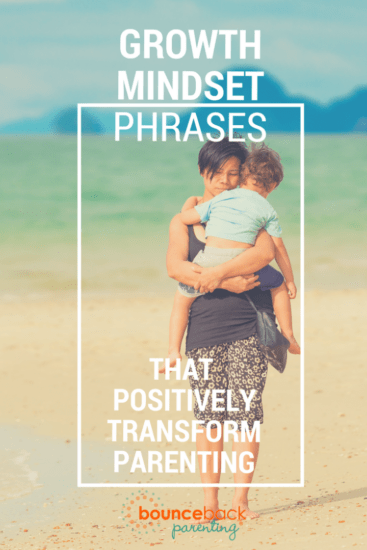 Find all the directions over at Meaningful Mama. 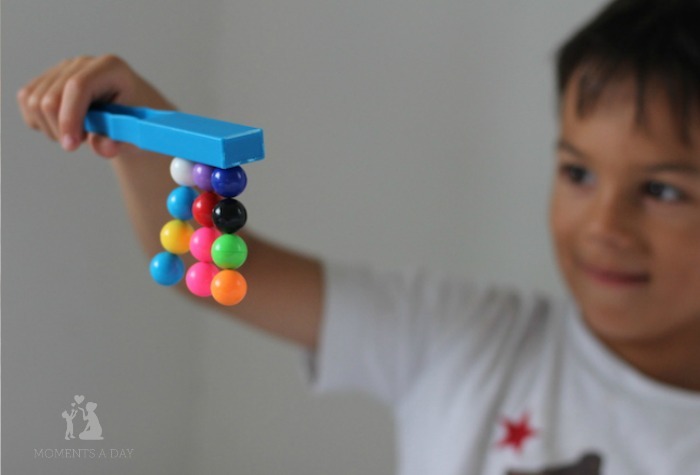 Have fun mixing and matching Emotional Eggs, a super fun activity that you can read the instructions for over at Laughing Kids Learn. Older kids would enjoy making these on their own, while you could make them for younger kids beforehand! Make a face (or many!) with different eye and mouth cut-outs to mix and match. 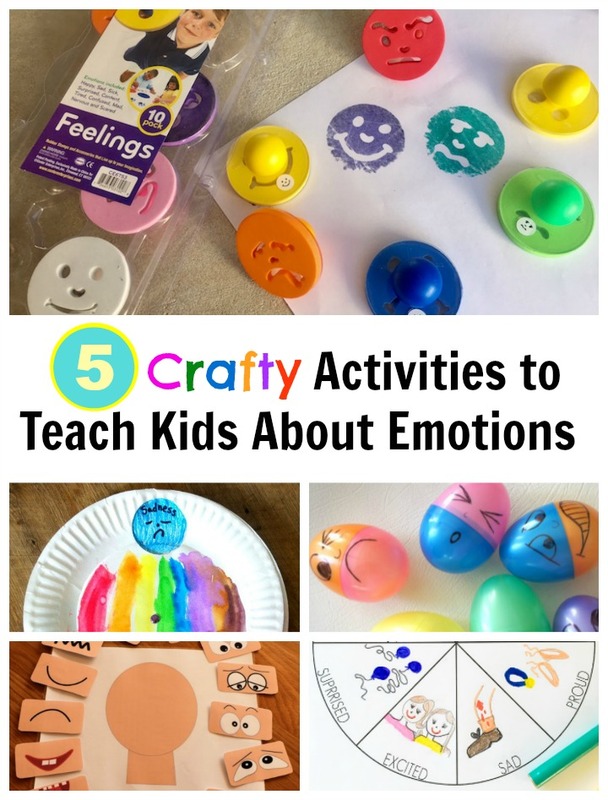 See all the different ways you can use this activity to talk about emotions over at Elsa Support. Download an Emotions Wheel (there are simple 4-part ones and more complex versions for older kids) from Childhood 101 that you can draw your own emotions in and use as a discussion prompt. 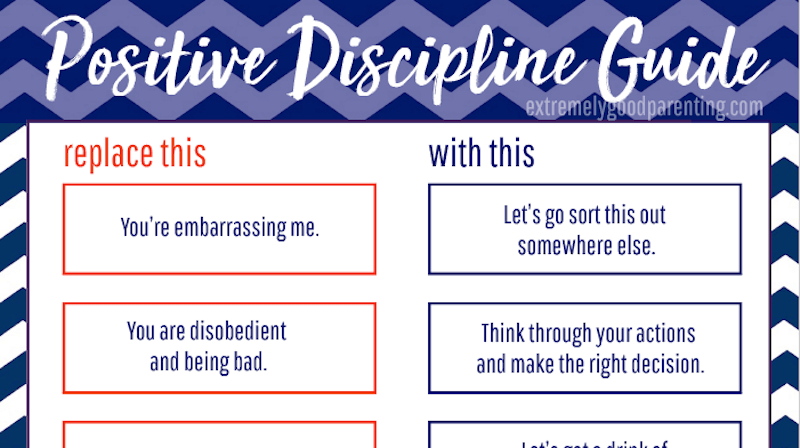 Would your child enjoy one of these activities? Let us know which you want to try first, or what other suggestions you have!